Subscribers save up to 40% over single ticket prices AND get the best seats in the house before single tickets go on sale. Now that each Jewell Mainstage Theatre show runs for six weeks, there’s a perfect seat for every subscriber. Pro tip → ask about availability later weeks if you’re looking for specific seats. Need an extra ticket for that family member or friend that’s in town? Get $7 off additional full priced single ticket purchases to Jewell Mainstage Theatre productions. Go Between the Lines in our subscriber-only newsletter with in-depth information about each production. Subscribers receive advance notice of special events, like the Subscriber Sneak Peek. Plus, you’ll be able to pre-order 2019 Jewell Mainstage Christmas tickets before they go on sale to the public. We get it, things come up. 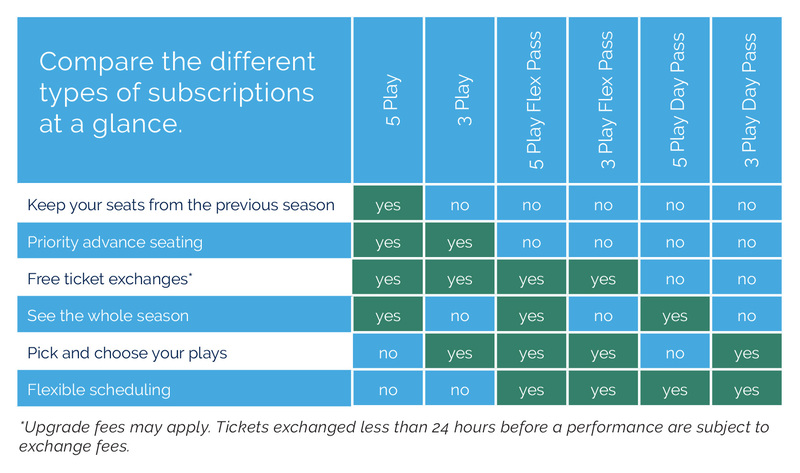 Contact the Box Office at least 24 hours prior to your scheduled performance and move to a different performance and seat of equal or lesser value at no charge. *Tickets exchanged less than 24 hours before a performance are subject to exchange fees. Mailed tickets must be returned when exchanging. We’ll send you dates and seating information and keep your tickets at the theater. You can make easy ticket exchanges by phone or email and you’ll never lose your tickets. Don’t panic if you misplace your tickets! Our Patron Representatives will print replacement tickets for you at the theatre, at no additional cost. Can’t decide which plays to see or which days you want to see them? Our Flex or Day Pass lets you enjoy Taproot Theatre on your schedule. Purchase a 5 or 3 Seat Flex/Day Pass and call the Box Office when you’re ready to see a show! Join civic leaders, theatre critics and VIPs on the first Friday of each show, then celebrate at our Opening Night reception with the cast and theatre staff. Midweek Matinees and Wednesday evening performances include dynamic, thought-provoking post-play discussions with the actors and artistic staff (excluding Wednesday preview). This is your chance to ask the artists questions.